Pulltarps Ratchet with Spring Tension being released. 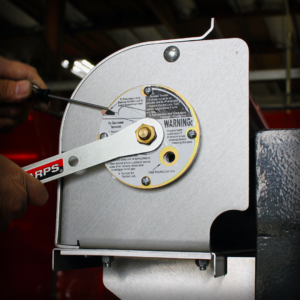 Pulltarps® original Semi-Automatic External Spring Tension Ratchet design, which is machined into the end plate, makes adjusting the spring tension fast and easy. When the spring has the proper amount of spring tension, the tarp can be easily extended and retracted, using nothing more than the Pullbar and Pull Rope. Follow the links below for the proper operation of the Ratchet System. Get Your Semi-Automatic System today!